2011: Tim Nokes used the retro look and palette of Canadian railroad posters that promoted tourism in the 1920s in designing this attractive 59¢ Parks Canada Centennial commemorative stamp (Scott 2470). 2012: Canada recalled two of its greatest fallen heroes in the first se-tenant pair in its War of 1812 Bicentennial series (Scott 2555a). The two stamps picture British Major-General Sir Isaac Brock (left) and Ohio-born Shawnee war chief Tecumseh (right). 2014: Known as Wait For Me, Daddy, a 1940 photograph by a Vancouver newspaperman showing a 5-year-old boy who realizes his father is going off to war was the subject of this heartfelt Remembrance Day-themed stamp. 2013: Canada marked 250 years of postal history with this “P” (permanent) stamp depicting Benjamin Franklin (Scott 2649), who was made joint deputy postmaster general of North America in 1753, and opened the first Canadian post office in Halifax, Nova Scotia. 2015: One of five-face different “P” domestic-rate (85¢) Dinos of Canada stamps in a set, this one depicting Tyrannosaurus rex (Scott 2823c, 2824) outfitted the colossal carnivore with a crown of feathers to go with its slavering jaws and massive, dagger-like teeth. 2010: This 57¢ Art Canada stamp showcasing the paintings of Prudence Heward displays Rollande, her unconventional portrait of a young working woman from rural Quebec (Scott 2395). 2009: This permanent-rate stamp (then 54¢) celebrated the centennial of the Silver Dart, the first airplane to fly in Canada (Scott 2317). 2008: One of two stamps issued to salute the oil and gas industry, this 52¢ Welder stamp (Scott 2267) marks the 50th anniversary of Canada’s completion of the first transcontinental pipeline. 2007: An early entry in its annual Flowers issue, this die-cut se-tenant pair of 52¢ White Lilac and 52¢ Purple Lilac stamps (Scott 2207-2208) depicts varieties pioneered and developed in Canada. 2006: A little girl looks on in awe as a beluga whale glides by on this 51¢ domestic-rate stamp commemorating the 50th anniversary of the Vancouver Aquarium (Scott 2157). Dec. 3 saw the opening of Linn’s 2016 U.S. stamp popularity poll, your chance to sift through the 154 stamps and postal stationery and their collectible face-different varieties turned out by the Postal Service last year. You can cast your vote online until March 1, 2017, for the best design, worst design, most important and least necessary stamps of the last 12 months. By my count, Canada Post issued 130 different collectible varieties of stamps in 2016, including 68 single stamps and a further 62 in souvenir sheets, special panes, and even a Star Trek 50th anniversary prestige booklet with 15 stamps in five panes. Where are the bouquets and the brickbats for these Canadian adhesives? In lieu of a poll, I’m showing one Canadian issue for each year of the past decade that is outstanding in one way or another — stamps I believe merit a look back. On June 15, Canada issued a 51¢ commemorative paying the domestic letter rate to mark the 50th anniversary of the Vancouver Aquarium (Scott 2157). The stamp is based on a marvelous photograph taken by Grant Faint. It captures what Canada Post called “the wonder of nature and the awe of children,” as a little girl raises her arms to the glass while a beluga whale blissfully glides by. Designed by Kevin van der Leek and printed in seven-color lithography by Lowe-Martin, 5 million stamps were printed in booklet panes of five (Scott 2157a), sold in two-pane booklets of 10 (Unitrade BK330). On the first day of March — that “in like a lion, out like a lamb” month when the hearts of many long for spring — Canada Post stoked those hopes with its annual Flowers issue, represented by this die-cut se-tenant pair of self-adhesive 52¢ White Lilac and 52¢ Purple Lilac stamps (Scott 2207-2208). They depict types of this popular flowering woody plant pioneered and developed in Canada. The souvenir sheets for these and other Canadian Flower issues are gorgeous, but I liked these simple stamps for their unusual shapes and minimal graphics that put the flowers in the spotlight. Canada Post announces 2017 commemorative stamp program: “Dear Collectors, 2017 is going to be a big year,” Canada Post’s stamp services director recently wrote. Designed by Isabelle Toussaint, the Lilacs stamps were printed in four-color offset lithography by Canadian Bank Note. Moisture-activated stamps perforated 13 by 12.7 were issued in two-stamp souvenir sheets (Scott 2206) and in self-adhesive booklets of 10, as well as on nondenominated international-rate postal cards (Unitrade UX174-175) and domestic-rate No. 10 stamped envelopes (Unitrade U243-244). One of two stamps designed by Tim Nokes and issued May 2 to honor Canada’s oil and gas industry, this 52¢ Welder on the Trans-Canada Pipeline (Scott 2267) marks the 50th anniversary of Canada’s completion of the first transcontinental pipeline on Oct. 10, 1958. Today, TransCanada Corp. manages more than 56,000 miles of natural gas pipeline across the continent, supplying more than 25 percent of the natural gas consumed daily in North American homes and businesses. The artwork in Nokes’ stamp design resembles that of a cloisonné pin, with rich colors sparking from the welder’s torch. Printed in six-color lithography by Lowe-Martin, 1,125,000 of each of the two stamps were printed in se-tenant pairs in booklet panes of ten (Scott 2268b), sold in single-pane booklets (Unitrade BK376). A beautiful commemorative to celebrate an important milestone in Canadian history, this nondenominated “P” stamp paying Canada’s first class letter-rate (then 54¢) was issued to celebrate the centennial of the Silver Dart, the first airplane ever to fly in Canada (Scott 2317). Lowe-Martin printed 3 million stamps in five-color offset lithography on Tullis Russell paper. On July 2, two Art Canada stamps and a souvenir sheet containing them both were issued to showcase the paintings of Prudence Heward (1896-1947). The 57¢ stamp shows Heward’s 1929 portrait of Rollande, a unconventional portrait of a young working woman from rural Quebec (Scott 2395). I love this and similar stamps depicting works of art that not only tell us about the artists, but about the men and women they portrayed and their lives and attitudes. An excellent enlargement and examination of Rollande and the artist by Julia Skelly are available online. Designed by Helene L’Heureux, these Art Canada stamps were the first Canadian stamps printed by Lowe-Martin in seven-color offset lithography on colorless, water-activated TRC paper in 16-stamp panes. Here’s a question many U.S. stamp collectors may have been asking in 2016: How can you mark the 100th birthday of your national park system with only a single stamp that won’t cost collectors $7.52? The answer was issued May 19, 2011, when Canada Post released its 59¢ Parks Canada Centennial commemorative (Scott 2470). The stamp was fittingly designed by Tim Nokes of Banff, British Columbia, where Canada’s first national park was created in 1885. Canadian Bank Note printed it in five-color lithography in self-adhesive booklets (Unitrade BK455) each containing a single 10-stamp pane (Scott 2470a). Four million stamps were printed, as were nondenominated international-rate postal cards using the same design (Unitrade UX245), also issued May 19. Here’s a tricky question: How do you make stamps commemorating a war that no one is particularly proud of 200 years later? Canada Post found the right answer when it began by recalling two of its greatest fallen heroes with a surprisingly benign-looking se-tenant pair of War of 1812 Bicentennial stamps (Scott 2555a) picturing British Major-General Sir Isaac Brock and Ohio-born Shawnee war chief Tecumseh. Brock was shot and killed in the first major clash and British victory of the war, repelling an American attempt to cross the Niagara River into Canada at the Battle of Queenston Heights. Tecumseh, who had hoped to create a confederacy of native tribes to resist American incursions on their lands, met his end in 1813 during the Battle of the Thames in southwestern Ontario. 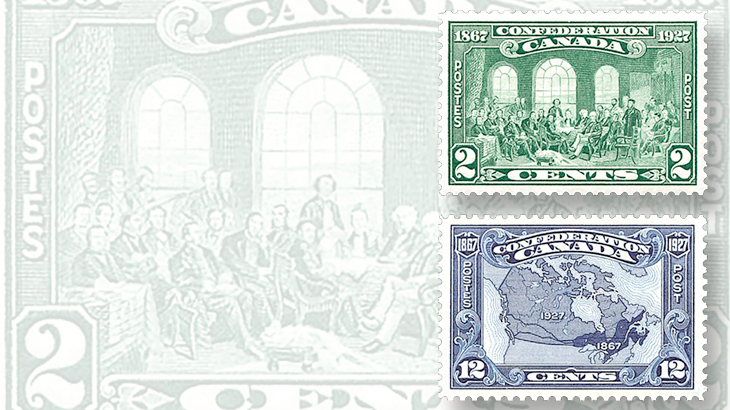 Designed by Susan Scott and illustrated by Suzanne Duranceau, the stamps show the two leaders in profile, facing each other with respect, with a bucolic background of Canada two centuries ago. Some 1.5 million of the “P” stamps (then 61¢) were printed by Lowe-Martin in seven-color lithography in 16-stamp panes. Canada marked 250 years of postal history with a “P” stamp (then worth 63¢) depicting Benjamin Franklin, postmaster of Philadelphia (Scott 2649). Franklin was made joint deputy postmaster general of North America in 1753, and opened the first Canadian post office in Halifax, Nova Scotia. Franklin is a powerful reminder to Canadians and Americans alike of our common heritage. That said, this lovely stamp is also a historical fraud, as its date of issue reveals. It was released on June 10 — the very day Hugh Findlay was made postmaster general at Quebec in 1763 — which is why Quebec City is featured in the background. Findlay is celebrated for having introduced a courier service from Montreal to New York to reach the monthly packet sailing to England, an ambitious innovation that put cash in the coffers of the British Post Office, which paid Findlay on the basis of his earnings. Andrew Perro designed the stamps, of which 1,350,000 were printed in 10-stamp panes (Scott 2649a) using seven-color offset lithography by Lowe-Martin. Another aspect of shared culture between Canada and the United States is our unity as Allies in both world wars. An American photograph of a sailor kissing a woman on V-J Day in New York’s Times Square became an enduring symbol of the end of World War II. It appeared in Life magazine, as had another iconic image five years before, when the U.S. was at peace and Pearl Harbor was just a sleepy naval base. On Oct. 4, Canada released a “P” stamp (then worth 85¢) depicting the famous Canadian photo known as Wait For Me, Daddy (Scott 2794). Susan Mavor adapted the photo to stamp format and added a poppy in one corner, a familiar Canadian symbol of Remembrance Day. Lowe-Martin printed 75,000 perforated five-stamp souvenir sheets with moisture-activated gum and 400,000 booklets with 10-stamp panes (Scott 2795a) in six-color offset lithography. Five highly creative and lifelike illustrations of different thunder lizards appeared in the Dinos of Canada stamps (Scott 2823-2828) issued April 13, 2015, each with plenty to charm and chill onlookers. My favorite by far of these permanent-rate (85¢) stamps depicts that king of Cretaceous apex predators, Tyrannosaurus rex (Scott 2823c, 2824). Toronto stamp designer Andrew Perro and Vancouver-based paleoartist Julius Csotonyi pooled their talents to produce an exceptional and memorable portrait that broke new ground, with a modest crown of feathers to go with the slavering jaws and massive, dagger-like teeth of perhaps the most terrifying carnivore that ever lived. To achieve a 3-D-like effect, Lowe-Martin combined four-color offset lithography and foil on the 10-stamp booklet and added embossing as well on the five-stamp souvenir sheet. I hope you enjoyed this admittedly subjective look as some of what I regard as Canada’s best stamps since 2006. Feel free to agree, disagree, or suggest stamps that you prefer. My email is fwtb53@gmail.com. What is on Canada’s 2016 Christmas stamps?